Missing links in inner Sydney’s network of cycle paths will be among the beneficiaries of $62 million in funding from the state government this year for so-called active transport. More than $1 million will be dished out for cycleways in Sydney’s CBD, including a link from Kent Street to the southern end of the Harbour Bridge. What do the new road rules mean for cyclists in New South Wales? Here are some Furry Facts, by John Shakespeare. A further $2 million will go towards building another stage of a cycle path along Lilyfield Road between Iron Cove and Victoria Road in Balmain. It will link to the the 5.8-kilometre Greenway bicycle and pedestrian corridor to the Cooks River via the Bay Run. The total amount of funding in the budget this year for about 150 local projects is a slight increase on the $59 million promised last year for more than 300 walking and cycling projects across the state. One of the biggest amounts this year – more than $5 million – will go to a cycleway and other projects at Kiama on the south coast. Coogee in Sydney’s south east will get almost $4 million for projects such as a two-way cycle path to nearby Kingsford. More than $1 million will be spent on shared pathways and pedestrian links in Parramatta. Transport Minister Andrew Constance said the government was “investing an unprecedented amount” on active transport infrastructure, making it easier for people who walk or ride to work to do so more safely. “Any way you look at it, this government has made record investments into active transport projects across the state,” he said. But cycling groups say the level of funding is disappointing given it makes up less than 1 per cent of the state’s $73 billion budget for infrastructure over the next four years. 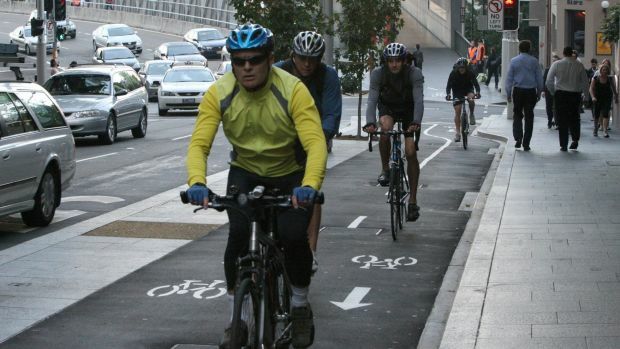 “The extraordinarily low level of funding unfortunately signals that the state government still won’t enable cycling and walking to meaningfully contribute to addressing the state’s transport and health challenges,” BIKESydney president David Borella said. A national survey released this week showed cycling to be on the wane in NSW, especially among women, as more people feel riding conditions have worsened. Early last year the government ushered in stiffer penalties for cyclists, which included a more than quadrupling in the penalty for riding without a helmet to $319. The funding in the budget is split almost 50:50 between cycling and walking projects, and several million dollars will be to complete projects that carry over from last year. Last year the government set up a separate $80 million fund to spend on cycling infrastructure over four years. One of the projects that money will go towards is improving access to the northern end of the Harbour Bridge which, at present, requires cyclists to scale several flights of steps. That project is still at the design stage. Greens transport spokeswoman Mehreen Faruqi said the budget had again failed to make much-needed investment on cycling and pedestrian paths.